Carrying a black casket labeled “The Newborn Georgian Democracy,” a group of bloggers in Yerevan have marched toward the Georgian Embassy protesting what they call the destruction and desecration of Armenian cultural monuments in neighboring Georgia. Bloggers tell the story. For Armenians, Georgia has always been a close country. But the experience of the last five years shows that [Georgia] is moving toward fascism… All that interests us is one thing – a crime, blatant hooliganism is going on: [Georgians] are destroying Armenian cemeteries, reducing historic monuments to dust. 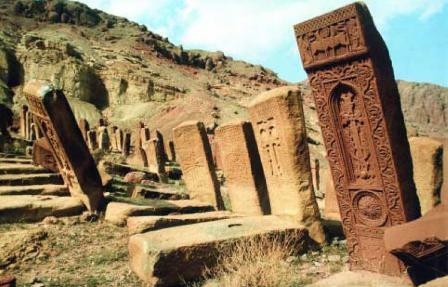 The recent controversy surrounds the removal of Armenian gravestones from Norashen, a church that Georgian priests are accused of taking over. A video, sent to me by a supporter of Armenian opposition leader Levon Ter-Petrosyan, shows riot police shooting from long distance toward post-election protesters on March 1, 2008 in Yerevan. The edited and dramatized footage also features a clip from an official announcement where a government spokesperson claims that the authorities have not used firearms against the protesters. Nonetheless, a police chief in Armenia has not denied that the police fired. The chief claims it was after the first shot was fired by the protesters that the servicemen were armed . According to a YouTube.com video, that I learned about from a post at the ArmenianGenocide.com forum, Slim Khezri (also known as Slim K), “an opinionated and well-experienced Artist” who plays the Arab pirate in the Pirates of the Caribbean 3 plays Turkish assassin Zeki Abaz in a short movie by Matt Van Gelder and Barry Taft – inspired by the assassination of Turkish-Armenian journalist Hrant Dink by a young Turk nationalist on Jan. 19, 2007 in Istanbul, Turkey. Slim Khezri is Germany-born, Los-Angeles living Tunisian. According to the YouTube.com preview (that actually has a few grammar errors), the film will be released in the Fall of 2007. Did Soldiers Videotape Their Own Vandalism? It could be a water bottle or something else, but a video camera is not ruled out either. In fact, the person who holds the object uses it too slow questioning its water bottle possibility. 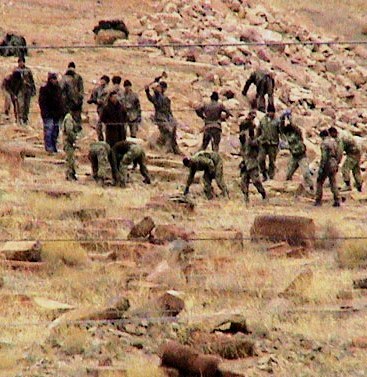 After a weekend of examining the December 2005 video from the Iranian-Azerbaijani border, I have speculations the vandals videotaped their own “heroism.” The video, taken by an Armenian film crew from the Iranian border, shows Azeri men in uniforms hacking medieval Armenian burial monuments down at the Djulfa (Jugha in Armenian) cemetery. The footage has become pretty popular by now and received over 10,000 hits in YouTube.com and other videos. Now, after going through some of the footage with examining every frame of that particular portion, I have noticed this object (circled in red) in the hand of a man pointing toward the Iranian border. Surprisingly, some of the men in the area are also looking into the same direction (circled in blue) offering speculation that the Azeri soldiers may have videotaped their destruction of the Armenian cemetery. If true, did they do this to prove to someone they did this or what?